Cheska Perez is a Filipina who was brought to the U.S. by her parents when she was just six years old. It’s the standard story. She didn’t have a choice. She didn’t know the U.S. government would shut down because of her. Perez entered legally when her father, like so many others from the Philippines, couldn’t find work to support his family there. So he found a job in America and brought the family to America legally on a work visa. But when he left his job, his visa ran out, and so did the legal protections for Perez and her family. Because of DACA, Perez has been on her own since age 18 and has lived the life of a Dreamer. She developed an app to help young people find college scholarships. Does it work? She’s her own best example. She found a scholarship program that gave her a full scholarship to a school on the east coast that cost more than $50,000 a year to attend and is ranked among the Top 40 national liberal arts colleges in America by U.S. News and World Report. Why do Trump and other hardline anti-immigrant Republicans want to kick her out of the country? Cheska Perez is one Asian American who is making America great again. I’ve known Perez for the last year, and as the federal government was about to shut down on Friday, I was on the phone with her. 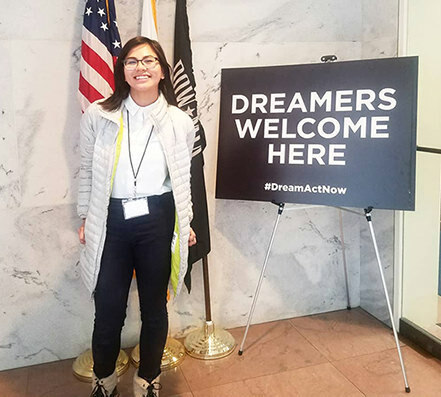 She was pretty calm considering that she and the other nearly 800,000 recipients of the Deferred Action on Childhood Arrival program had become Washington’s new political football. She was true to her dream, hopeful. Well, now we know they didn’t. And if you’ve been following the negotiating process, we already know why. A year into the lowest rated presidency in modern history, this we know to be true: Donald Trump may know the art of the deal, but when it comes to politics, he doesn’t know diddly. Not when it comes to running the government, or building a political coalition. Trump is so outside of his “expertise,” it’s no longer funny that he is taking down the office of the presidency, our country, and our democracy with him. Hyperbole? Just look at how this DACA embarrassment unfolded. You’ll recall the meeting a few weeks ago when Trump brought that bipartisan group of Congressional lawmakers into the Oval Office. “You folks are going to have to come up with a solution. And if you do, I’m going to sign that solution,” Trump said. Trump was practically gushing while the media cameras were allowed to roll overtime. Why not? To counteract that tell-all book by Michael Wolff, “Fire and Fury,” Trump seemed to decide it was time to make us all veritable flies on the wall so we could see for ourselves. For the first time, he was saying things that made him sound vaguely presidential, especially on DACA. “I feel having the Democrats in with us is absolutely vital, as it should be a bipartisan bill, it should be a bill of love, truly it has to be a bill of love,” Trump said. Trump even said he’d agree to a “clean DACA” bill separate from other issues that make up comprehensive immigration reform, such as “chain migration,” the ugly rhetorical phrase conservatives use to condemn what humane folks have called “family reunification” for deacdes. But Trump still wants that border wall and bragged that as a builder, he can get it done for less than $18 billion. Trump was remaining the optimist. Those were the words by “Mr. I’ll Take The Heat” that began the negotiation that lawmakers on both sides trusted. When I wrote about it on Jan. 10, I wondered if it was real or just a set-up. Now we know it was the latter, and that the president is not a man of his word. Then he denied it, despite what others said they heard. And now we see the rhetoric change about DACA mid-negotiation. Trump’s love? Maybe it was like the love he felt for Stormy Daniels, because now the word thrown around in negotiations is “amnesty,” as in “No Amnesty,” for the DACA Dreamers. And back we go into the political quicksand. At this point the saving grace is the action from U.S. District Judge William Alsup in San Francisco, who issued a nationwide preliminary injunction that blocked Trump from killing off DACA before several lawsuits challenging the program–by state attorneys from California, Maine, Maryland, Minnesota, the University of California, and DACA recipients–were resolved. Judge Alsop’s ruling allows anyone who had DACA status on Sept. 5 the right to renew. And it buys a little more time for Congress to bring Trump up to speed and get a deal done. For now, the best advice may come from UC President Janet Napolitano, who knows a thing or two about DACA. She helped write the law. She knows more than the president of the whole country, who seems to believe the last person he talks to. He’s not talking to Cheska Perez. But now we also know how to evaluate Trump. One year into his presidency, the shutdown exercise exposes the true value of the president’s words. Zero. Trump should have learned by now, the United States is no reality show. We didn’t need another cliffhanger on DACA. In the meantime, Cheska Perez waits for sanity, for someone to stand up to the bully Trump. Or for the bully to come to his senses. Perez continues to do what she can. She protests and goes to Washington to lobby Congress. She’s at the max and can’t reapply for any more extensions. But her papers are good through the midterm elections. She’s not giving up. Will she be forced back to a Philippines she left 14 years ago when she was six? Her reality, her future, shouldn’t be based on Trump’s whim. Cheska says she’s not giving up now and stands strong with her fellow Dreamers. How can they quit now? Trump has just told them they are powerful enough to shut down the U.S. government.